It’s here! 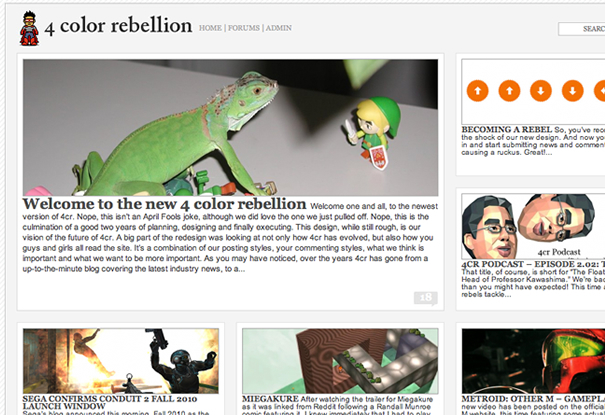 The first time I have featured a website that I worked on – 4 Color Rebellion. I would have featured them anyway, so I am delighted to have had a hand in their latest redesign. Designed by what amounts to the entire staff of creative, critical, journalistic, and mostly video game and comic book fanatics, ourselves, along with the 4CR community. I came in during the rough cut, going through a few iterations of how to best cater to this community of discerning video gamers and bande dessinée appreciators. Over three years in the making, I helped in strategy, web design, css, html, WordPress theming, plugin customizing, and a few other things. We really went all out, including some ajax, jquery ui, and social treats like open id and forum integration to satisfy the need for a clean simple, fun place to get a fix. Catch the latest news and releases. Purchase new games through the website’s own Amazon store, read and view videos of honest reviews and opinions, inside jokes, all while interacting with other members, voting on your favorite articles and increasing your own status to win prizes by uploading news stories and contributing comments. This website has it all and it has been fun to get into this community and I will be contributing and continue working with them on the next phase. Below is a screenshot of the previous version. 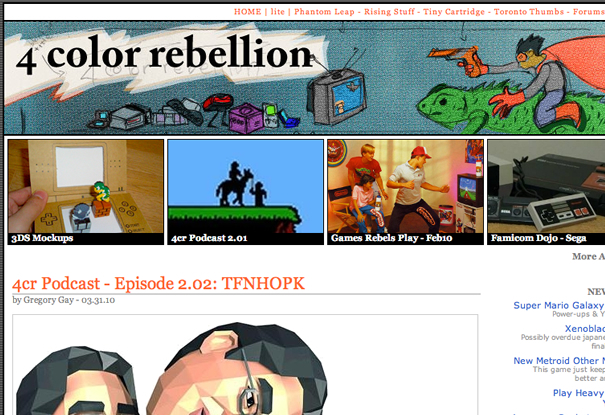 It was loved, I’m glad the redesign will accommodate the next exciting generation of 4 Color Rebellion.